Edit: thanks to everyone for spotting me on 30m last evening. I think our short (and very unscientific) test was a success. Results for 30m wspr test. First of all we’re just having a bit of fun here. Insure the wire antenna and the loop are radiating in the same direction! Many of the tests I’ve seen so far, treat the loop as if it’s an omnidirectional antenna. In fact the Loop is very directional. So if we happen to point the Loop into a direction where there are no stations to hear it, while comparing it to an antenna which is omnidirectional, IMHO the test will be flawed. For this test, both dipole and the magnetic loop are pointing South-West! We also need to give the loop a fair chance! Like a dipole the loop can be deployed in various configurations. In this test, I’ve configured the loop with a larger main and coupling Loop for greater performance on Lower bands. Rather than using the small, agile, and very portable main and coupling Loops, I switched over to the larger booster kit, putting the dipole and magnetic loop on a More Level Playing Field. Often tests are done with a magnetic loop in a “performance compromised configuration”, where portability is it’s main goal. The beauty of the magnetic loop, is it can easily be reconfigure for either better performance, or increased Mobility! The magnetic loop was -0.46db down on the dipole. 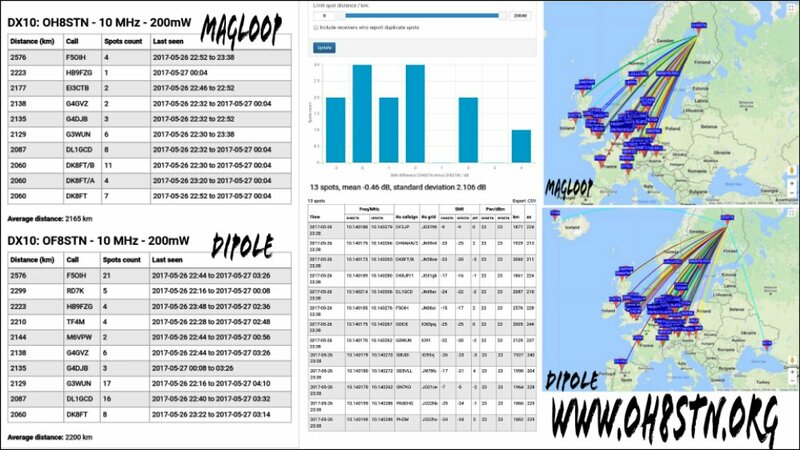 Looking at the dx10 results, average range of the dipole was 2200km while the magnetic loop came in with a very respectable 2165km. In regards to regional comms, limiting results to 2000km, the magnetic loop was only down -0.13db compared to the dipole. Which brings me to another point. I think the next test to run in this series is the magloop versus the dipole on 40 meters for an regional comms test. You see in today’s world not all amateur radio operators are focused on dxcc or winning awards for talking to other stations on the other side of the globe. Many of us are distinctly focused on Regional Communications for disasters or preparedness. So the question becomes: is the dipole really that much better when we’re focusing our attention on Regional Communications?”. It’s just one question, but it is a good one. Finally guys, look there is no right answer or wrong answer here. There’s also no winner or loser. Every antenna system has its pluses and minuses, its strengths and weaknesses, … What we gain from doing these kind of “silly tests”, is a better understanding of how each tool in our toolbox works. That’s it! ? So build yourself, or by yourself a magnetic loop, or other “compromise antenna” and start experimenting! That’s the only way we’re going to learn. Just in case you’re interested, and if you happen to have your WSPR RX up and running, tune in to 30m and try to spot me this evening. 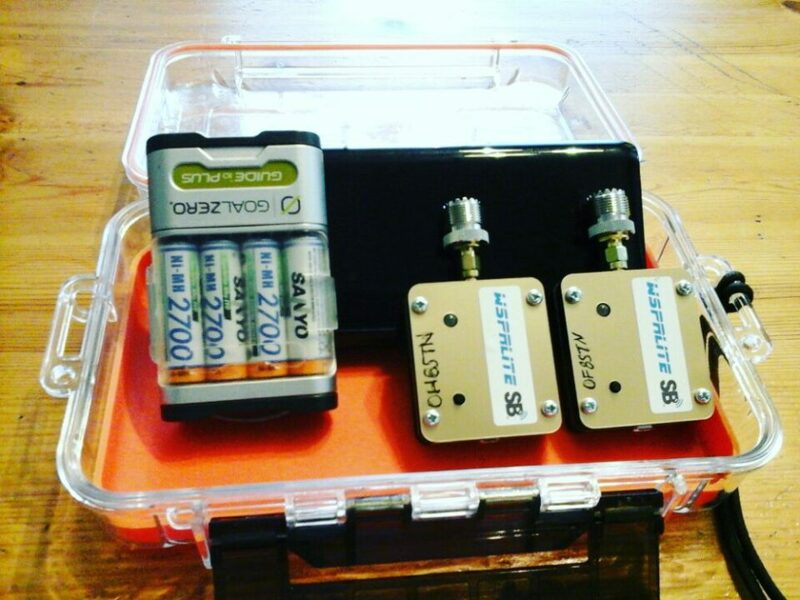 This time I’m testing the BBTD (reference antenna) against the Chameleon P-Loop 2.0 with the Giant Booster kit! The dipole is configured as OF8STN. The magloop is configured as OH8STN. Both are running wsprlites at 200mw. I’ll leave it up for the next few hours.